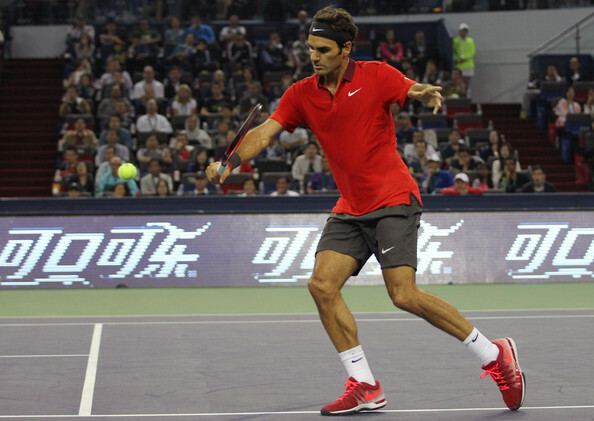 Roger Federer and Julien Benneteau were level each step of the way in the first set of Friday night’s quarterfinals at the Shanghai Rolex Masters, until the Swiss maestro blew it wide open. In a match that very well could be a preview several weeks from now in the Davis Cup final, both players started well. The 33-year-old Swiss stayed one step ahead on serve, but the Frenchman kept pace to head into the first set tiebreak. Federer broke the 3-all tie midway in the tiebreaker, capitalizing on catching Benneteau off guard in going behind him to end points. On his second set point, the 17-time grand slam champion aggressively stepped into the center of the court and whipped a backhand winner cross court. From there, it was all Federer, who jumped out with a break in the second set, heading to bagel the Frenchman. After 1 hour 9 minutes, he secured his place in the Shanghai Rolex Masters semifinals against Novak Djokovic, 7-6 (4) 6-0. @RogerFederer denied a challenge at the 2014 #Shanghai #Rolex Masters and an interesting conversation follows (Part 1). Get the latest news at federerfan07.com. All Roger #Federer. All the time. @RogerFederer denied a challenge at the 2014 #Shanghai #Rolex Masters and an interesting conversation follows (Part 2). Get the latest news at federerfan07.com. All Roger #Federer. All the time. @RogerFederer denied a challenge at the 2014 #Shanghai #Rolex Masters and an interesting conversation follows (Part 3). Get the latest news at federerfan07.com. All Roger #Federer. All the time. @RogerFederer denied a challenge at the 2014 #Shanghai #Rolex Masters and an interesting conversation follows (Part 4). Get the latest news at federerfan07.com. All Roger #Federer. All the time. @RogerFederer denied a challenge at the 2014 #Shanghai #Rolex Masters and an interesting conversation follows (Part 5). Get the latest news at federerfan07.com. All Roger #Federer. All the time.